On Sunday night November 3rd, 2013, Sydney, Australia, @ 23:49:56 AEDT, a hybrid – Annular/Total Solar eclipse will form for the New Moon. What’s usual about this eclipse new moon! Well here in Australia the last lunation cycle, new moon and subsequent full moon, Pluto was rising, given my reports (http://www.gregoryclare.blogspot.com.au/) and the outcomes of the having Pluto rising we are now going to experience the curious case of Pluto again featuring on an angle (Pivot) but this Time Hades will be on the setting pivot, sinking into the Abyss! Other peculiar characteristics to this special new moon (which are many) is the attention drawn to the four Pivots, (Angel’s) with the eclipse MC, at 28:40 degrees Aries, the ascending degree of the National Federation 1901 chart (Gwen Stony). Also the transiting eclipse setting degree is conjunct the Federations natal Sun/Saturn conjunction in the tenth whole sign house, which along with the transiting Pluto and Uranus exact square are a focus point. Transiting Mars the traditional ruler of the eclipse is in an exact sextile to the eclipse Lights (Sun/Moon), furthermore transiting eclipse Mars is exactly conjunct the federation’s natal Mars in the 6th house, (mundane house of Military, Health and more activities) which is square the Federations natal Venus in the 9th house. (Foreign Affairs, Immigration) Mars as ruler of the Federation’s natal ascendant and natal eighth whole sign house (Tax, Death and all things hidden) poses are few interesting question! So what does all this transpire to? Let’s take Pluto’s positioning first, this symbol that is from a modern prospective sharing the rulership of the eclipse, and as it is, for the most part along with Mars, the strongest placed planet. Pluto in the transiting eclipse chart is in the house of partnership or relationships. This informs us that all government agreements and dealing will be of a Plutonic nature and as transiting Pluto is going through the federations natal 10th, which is the most noticeable house of the chart, we can expect to see some real difficulties for the Government on shared dealing and negotiations. Now when this eclipse chart is viewed (bi-wheel) with the federations chart there are many special and unusual aspects to synthesise into the whole. Transiting Saturn/Sun/Moon/North Node/Mercury are all in the Federation’s Eighth whole sign house of Scorpio and making direct contact with the Federation natal Sun/Saturn and natal Mars, who is aspecting Federation natal Sun/Saturn and natal Venus. 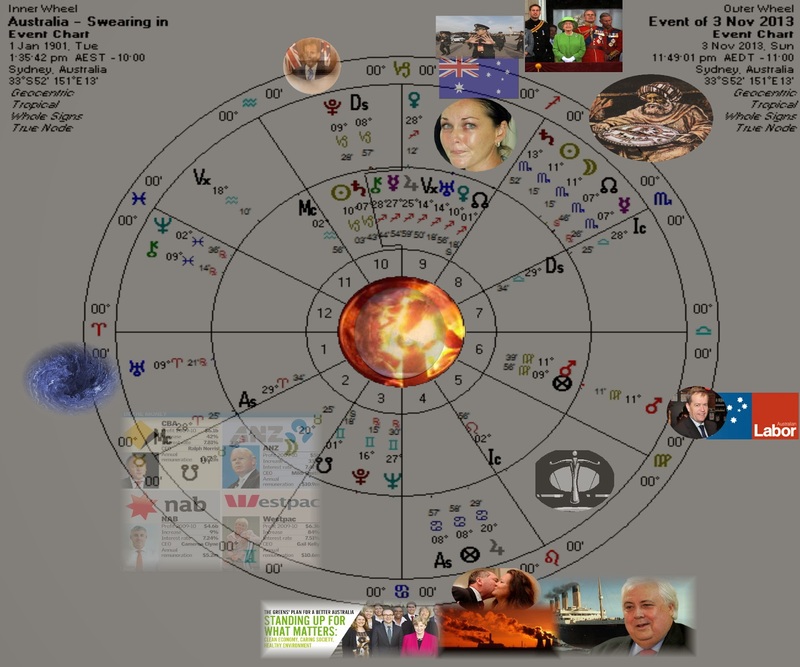 As you can see this is a complex set of patterns signifying some major events and future actions, measures, proceedings, dealings and activities that will surface. I posted some time ago on my website my thoughts on Saturn’s passage through Scorpio and alluded to the Big Brother (Spying surveillance issues that might arise, law and order) approach. The signification of the Federation natal Mars return (Mars is also ruler of the eclipse) should not be overlooked! Two malefic planets making contact with almost all of the other planets speaks of major obstacles to negotiate. However Mars may be in better shape than it first looks! Due to the Nocturnal eclipse chart Mars is more favourably placed with regards to its action. This may result in reconstructive negotiated outcomes, or-be-it of a Plutonic nature. All-in-all this special new moon will signify some very notable changes to how we Australian’s interact both internally as well as externally. Finally the transiting eclipse chart taken as a special new moon alone shows the lunation falling in the transiting mundane fifth house. This house shows the mundane affairs of the Senate, amongst other activities, and as such ruled by Mars/Pluto will present many obstacles along with the eclipse transiting tenth house, also ruled by Mars.